Beat the Press teaches you overt and covert tactics that only a media insider would know. 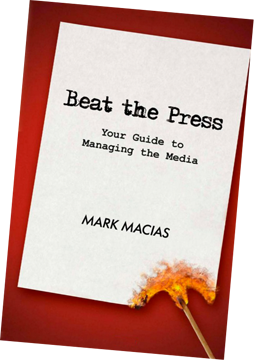 From leaking information to a specific source; to answering a reporter’s difficult questions; to finding the right media hook to pitch, Beat the Press provides practical steps to help you spin any story into your favor. Some of the tactics revealed in this book will be simple, like learning how to answer a tough question with another question. Other steps require the strategy of a war planner, like approaching the proper reporter, producer, editor or news executive when pitching a story. You will also learn in this book how to assess the cost and risk of speaking to a reporter on the record versus a written statement. Real life examples are scattered throughout the chapters, teaching you what businesses and people did right and wrong with their media encounters. You can buy the book on Amazon now.